"Where have you gone Eddy Bosberg. A nation turns it crying eyes to you... What's that you say Noël Foré? 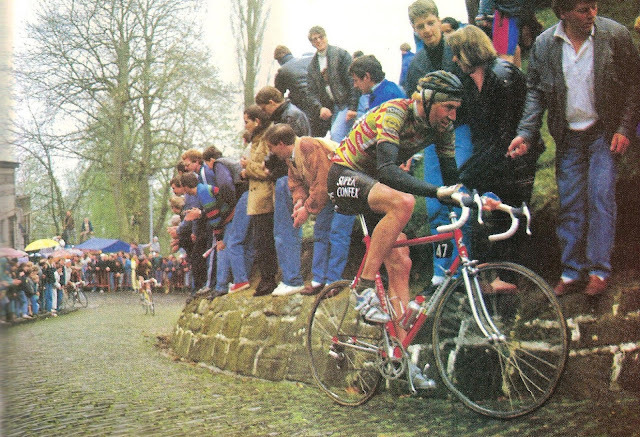 Eddy Bosberg's left and gone away..."
The photo isn't from the Bosberg.. it's De Muur, where in 1989 Edwig Van Hooydonck softened up the selection in a cold, wet rain soaked Ronde van Vlaanderen before the killer attack on the final cobbled climb that gave him his nickname for eternity. That '89 Ronde was a real flahute special. Riders coming in one by one. Wasted, wet and cold, covered with mud, with frozen fingers and numb feet. On the podium, the 22 years-young Edwig burst into tears of joy and relief. Which didn't stop. For long minutes. But every Flemish heart watching, understood completely. Hearts that lament the loss of the Muur-Bosberg finale this year. The nostalgia keeps on coming jongens. Here's a documentary the "Tour Cycliste de L'Est," a stage race in the Eastern Townships of Quebec, in 1971. Just put up on youtube courtesy of Kopp's cycles in Princeton NJ. This period film profiles the Century Road Club team - John Allis, Stan Swaim, Doug Dale, Bobby Phillips and Flip Waldteufel - back before they became the now legendary "Raleigh Boys". You might have noticed that Le Coq Sportif will produce the Tour de France's leaders jerseys this year. It's been since 1988 that a French brand provided the jerseys for the event that's much more than a race. It's a national institution. The Maillot Jaune is a prime attribute of the Tour's brand personality. And Le Tour is big component of France's brand personality. It showcases, and sells the beauty and diversity of France, and French culture, to a 'rest of the world' doing it's utmost to dilute it. Putting it into a technology-fueled, melting pot called globalization. Somehow, keeping Le Tour French seems pretty important to me. Even in an age when money talks perhaps more than ever. For most of its century-plus of existence, having a French brand supply the official sportswear to the Tour was a fait accompli. Flahute's WAG 'tale': Before Brady, there was Coppi. Hoi cafesupporters! Flahute here! 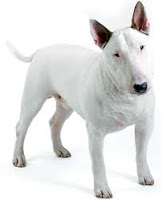 Fast Eddy's pretty tired from a three hour ride with two hours of tempo, but as I've been MIA for awhile, I'm writing today's post... Another raging bull-etin from your favorite no-bull terrier. "Thank GOD the Super Bowl is finally over. Living here in New England, the media hype was over the top. Forget the game, I'm most annoyed that so many commercials portrayed canines in stupid situations. Here's a poster for a 'long lost' movie from 1940. Shot in 1939 on the eve of WW2, release in a year that saw France fall, this film was hugely popular according to Jean Bobet. In Petain's Nazi occupied France, cultural rallying points like this were a lot more than necessary. They were a lifeline. The bike was a symbol of lost freedom, liberté. The plot? 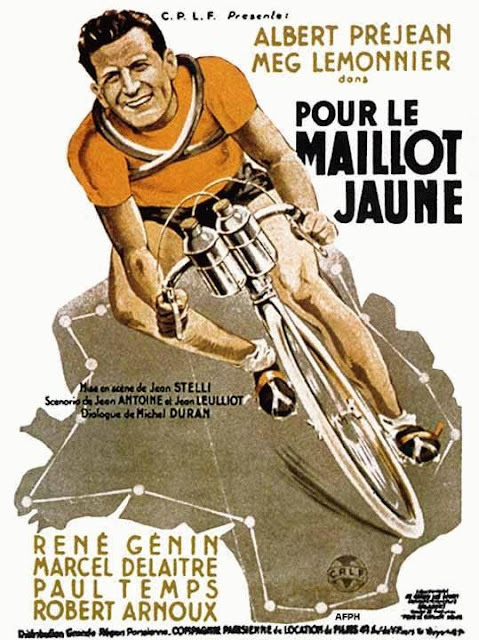 30's film star Albert Prejean stars as the Tour de France favorite who does poorly in the early stages, and wants to quit. 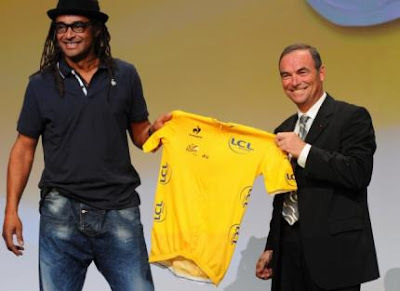 But thanks to the help of a journalist, he wins the maillot jaune. In the end, the hero loses the jersey, but wins the girl. This film truly might be as lost. No sign on the web anywhere, not even a B&W photo. Photos of the day: 'A Sunday in Hell'... the year before. If you're reading this blog, there's little doubt you've seen the 1976 Paris Roubaix race immortalized by Jorgen Leth in his documentary "A Sunday in Hell". Arguably the best film ever made about cycling. 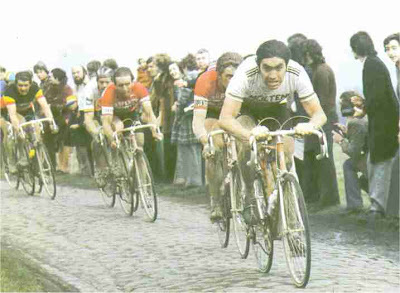 But what you may not know is that as exciting as that '76 race was - when Flandria's colossus Marc DeMeyer beat DeVlaeminck, Moser and Kuiper in a 4-man sprint - the prior year saw another four man finale that was perhaps even better. Excepting the 5th place of the then-young Franceco Moser, the 1975 Paris-Roubaix was dominated by Belgians, taking 8 of the top 9 places. Much like this year's World Cyclocross championship, it was an all-flahute throw-down. This one held over seven hours that included 130k of wet, muddy pave.